In 2016, the VCU College of Engineering expanded into the Virginia Biotechnology Research Park, a 34-acre life sciences community that houses private sector companies, research institutes, non-profits and state and federal laboratories adjacent to the VCU Medical Center. The research park’s Biotech Eight is now home to many of VCU Engineering’s most advanced facilities. The college’s “wet labs” in Biotech Eight support VCU’s pharmaceutical engineering initiative with specialized instrumentation including nuclear magnetic resonance, gas chromatography-mass spectrometry and liquid chromatography-mass spectrometry. VCU’s artificial heart lab, which features a mock circulatory loop and flow visualization, is in this facility. 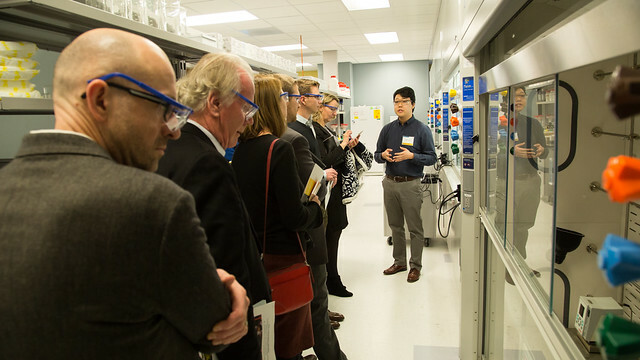 Biotech Eight also supports the college’s collaborative research programs with “dry lab” facilities including a Precision Imaging Research Laboratory (PIRL). VCU’s pharmaceutical engineering outreach programs including Medicines for All and Pharmacy on Demand (see pages 14-17) are headquartered here. So is VCU’s Center for Rational Catalyst Synthesis (CeRCaS), the world’s first and only research center that focuses on understanding the chemical fundamentals of catalyst synthesis. The Center for Human Factors and Rehabilitation Engineering is also in Biotech Eight. In addition to labs, VCU’s Biotech Eight facilities provide work areas that support the college’s culture of research, education and collaboration. It is the location of Institute for Engineering & Medicine offices and conference rooms. It is also where the college’s new Ph.D. program in pharmaceutical engineering will be headquartered.